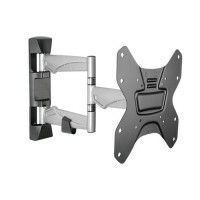 The QDA20-223 is a full-motion wall mount for most 23''-43'' LED, LCD and OLED flat panel TVs up to 30kg. The arm can be stretched up to 410mm for a full range of movement to perfectly position your screen. Swivel up to 90° left or right and -8°/ +12° vertical tilt. This pre-assembled arm comes complete with integrated cable management and decorative covers to ensure an elegant tidy look. Its built-in level adjustment offers 3° clockwise and anti-clockwise turning to ensure it is perfectly level. Strength has been tested for a minimum of four times its stated load capacity and is compatible with VESA hole up to 200x200.